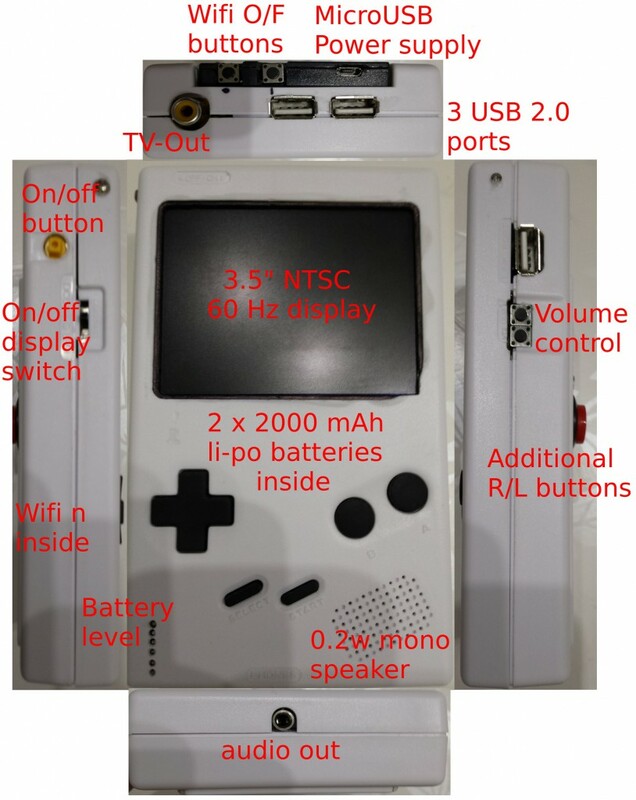 I have seen some guys who put a raspberry pi in a Game Boy case (eg. here or here). Being a fan of retro-gaming, I wanted to do the same for me and my children. But I wanted something a little bit more polished than what I saw, I mean better looking, better battery life, etc. I discovered at the same time the Odroid-W (which is, unfortunately, no more produced). Off course, I also used some wires and electrical tape. I Unsoldered 2 ports : one for internal wifi and one for the right side, in place of the original Gameboy Link port. I also splitted the original USB hub cable to plug it directly on Odroid-W GPIO headers. The display was said to work with 6-12V, but could easily be used with 5V by bypassing the voltage regulator (the display is orginaly for cars). The purpose was to use an (part of) original game cartdrige to fill the game hole on the Game Boy case. I used it to add two buttons (wifi on / wifi off) as well as the power/charging micro Usb connector. The only way to install things on a bare Archlinux is to use Pacman (or Yaourt) and an internet connection. Unfortunately, wpa-supplicant is not installed by default and my Retro Boy has only a Wifi card. So the first step was to use chroot and Qemu + BinFmt to install and configure wpa-supplicant before booting on the real hardware. The first two step I did was to install Yaourt (https://archlinux.fr/yaourt) and configuring a cross-compilation environment (compiling only on the broadcom SoC is just an huge time consuming task). See http://archlinuxarm.org/developers/distcc-cross-compiling. The configurations files for Retroarch and EmulationStation are available in the download section at the end of this article. During my tests, I did not retain 3 engines that I originaly wanted. It was running, but not full speed (some game like motoracer was around 55 Fps)… the Broadcom SoC of the Pi is definitely too slow, even with my highly overclocked settings. Running games with GPIO buttons was quite easy with Adafruit’s retrogame. But I wanted to use some buttons to do more OS based actions : turning on/off wifi and changing sound volume. As I’m using only one speaker together with a mono amplifier wired to one of the two audio channels, I configured a default route to make alsa merge both right and left audio channels to the left one. As my ampli is a little bit too powerfull for the small speaker, I also limitted the output to 70%. The battery indicator is based on the Odroid-w embeded PMIC controller (a Ricoh RC5T619). I wired a 6 leds breadboard to GPIO pins and used a bash script to update leds status every 2 minutes regarding the battery statuts as reported by the kernel. The indicated capacity (/sys/class/power_supply/battery/capacity) is not accurate. I had to “calibrate” myself the indicator using /sys/class/power_supply/battery/voltage_now (which is also false regarding the real voltage I measured…). The init_emmc_clock value allowed me to push SDCard speed from 18 to 23 Mb/s (using dd to benchmark). After that all was working correctly, I ended the install process with the following steps. Finaly, I used the EmulationStation’s scaper to enhance game listings. Hardware : which ARM mini-pc to replace an x86 server ?